Rising property prices and inflation are natural in a growing economy. Hence, when it comes to tackling the issue of making homes more affordable, the government should look at improving the individual’s financial position instead of offering more so called affordable homes and adding to the current supply, said EdgeProp.my managing director and editor-in-chief Au Foong Yee. In her presentation entitled “What are you getting into? Make informed investment decisions” at the EdgeProp.my Talk on “Are you destroying your investment in Real Estate?” on Oct 20, Au said the local property market has ample supply of houses of various prices that suit different income groups, so much so that there is a record high number of overhang units in the market today — with a majority of them deemed affordable. According to the National Property Information Centre (Napic), there are 29,227 overhang residential properties as at 1H18 compared with 24,738 units in 1H17. Overhang properties are completed units in the market that have obtained all the certifications and are ready for occupation, but have remained unsold for more than nine months. The figure is cumulative and includes units from the latest period under review. Au noted that of the total number of overhang properties, those priced RM300,000 and below totalled 10,384 units while properties priced between RM300,001 and RM500,000 stood at 7,499 unsold units. There were 7,525 properties priced RM500,001 to RM1 million and 3,819 properties priced RM1 million and above. Earlier in October, the Housing and Local Government Ministry (KPKT) had introduced three price categories of affordable housing — RM150,000 and below; RM150,000 to RM300,000; and RM300,001 to RM500,000. 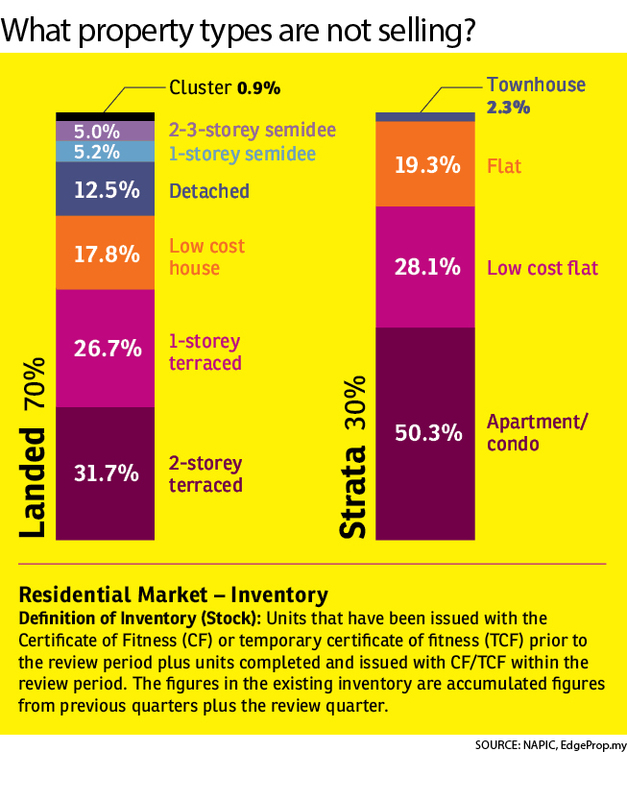 With the property overhang in these categories, do we need more of such homes in the market? “The new Pakatan government aims to offer one million affordable homes within two terms of governing. Do we really need one million homes? Maybe we should rethink why the low-cost houses are not selling? It could be because of location, the living environment or other reasons. “The market is never short of housing supply but the low discretionary income is the main concern. People just can’t afford it [buying a house],” said Au. Au noted the recent Khazanah Research Institute report that revealed Malaysian households with incomes of about RM2,000, after deducting all their expenses, have only RM76 left to spend. 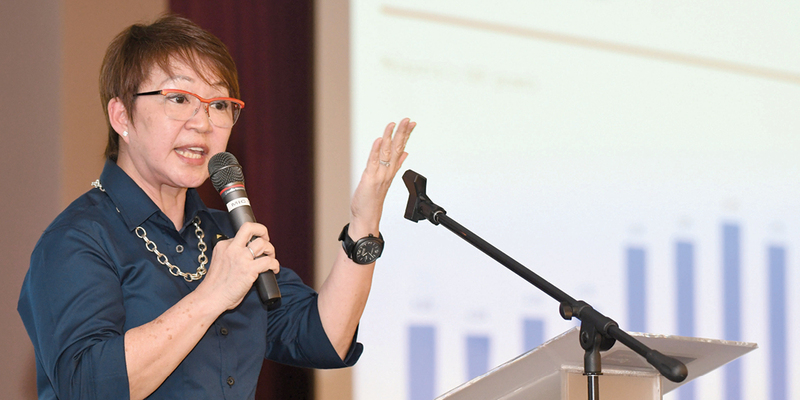 “This showed that many Malaysians face difficulties in making ends meet, what more to buy their own property,” she said. Despite the government’s efforts in bringing down housing prices by reducing construction costs, requesting that developers reduce selling prices and considering relaxing lending guidelines, the individual’s purchasing power is still a key factor in whether one could afford a home. “Hence, we need a revolutionary way for people to own a home, instead of lowering the bar [of end-financing] or building more homes; we need to find other ways (towards homeownership],” she said. On the current property market, although there is much talk of a property bubble waiting to burst, Au pointed out that a bubble is a situation when the market reaches a “boiling point” and starts to “bubble”, but recent transaction volume and value have not indicated a bubble. Housing transaction volume has been decreasing since 1H14 while transaction value has maintained its growth momentum. Nevertheless, Au noted that price growth has been flat in recent years. This shows that developers have responded by introducing more affordably-priced residential units. “But what worries the market is that developers tend to move in the same direction and offer the same products as they lack the right information that can help them decide what to develop. They tend to follow what others are doing. This could cause an oversupply of certain property types,” she said. To resolve this problem, Au urged the government to provide transparency and clarity in the market with regards to housing and supply distribution as it could help solve the current mismatch in housing demand and supply in the market. Following Au’s talk, EdgeProp.my’s business development division account manager Stannly Tan gave a presentation about the EdgeProp.my property portal. He stressed the importance of relevant facts and figures in helping consumers make informed decisions in property investment. “For instance, on the EdgeProp.my website, we have quite a number of useful and free tools, such as area price comparison, project reference price, home purchase calculator and a time travel tool that could be of help to homebuyers while doing their research on a potential property they may be interested to invest in,” he said. The half-day event was organised by EdgeProp.my, in partnership with Nippon Paint Malaysia. This story first appeared in the EdgeProp.my pullout on Oct 26, 2018. You can access back issues here.